Migraine is a common and debilitating neurovascular disorder with a complex envirogenomic aetiology. Numerous studies have demonstrated a preponderance of women affected with migraine and previous pedigree linkage studies in our laboratory have identified susceptibility loci on chromosome Xq24-Xq28. In this study we have used the genetic isolate of Norfolk Island to further analyse the X chromosome for migraine susceptibility loci.An association approach was employed to analyse 14,124 SNPs spanning the entire X chromosome. Genotype data from 288 individuals comprising a large core-pedigree, of which 76 were affected with migraine, were analysed. Although no SNP reached chromosome-wide significance (empirical α = 1 �~ 10-5) ranking by P-value revealed two primary clusters of SNPs in the top 25. A 10 SNP cluster represents a novel migraine susceptibility locus at Xq12 whilst a 11 SNP cluster represents a previously identified migraine susceptibility locus at Xq27. The strongest association at Xq12 was seen for rs599958 (OR = 1.75, P = 8.92 �~ 10-4), whilst at Xq27 the strongest association was for rs6525667 (OR = 1.53, P = 1.65 �~ 10-4). 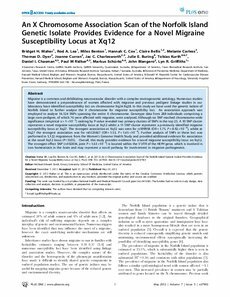 Further analysis of SNPs at these loci was performed in 5,122 migraineurs from the Women's Genome Health Study and provided additional evidence for association at the novel Xq12 locus (P<0.05).Overall, this study provides evidence for a novel migraine susceptibility locus on Xq12. The strongest effect SNP (rs102834, joint P = 1.63 �~ 10-5) is located within the 5'UTR of the HEPH gene, which is involved in iron homeostasis in the brain and may represent a novel pathway for involvement in migraine pathogenesis.